As Official Media Partner for Paris Air Show 2015, Air Recognition, part of Army Recognition Group, will have a significant presence at the show to provide a full coverage about this event. Published online and updated daily, if you cannot attend Paris Air Show 2015, follow all activities of Paris Air Show 2015 with our news, reports, pictures and video. The Online Show Daily News Paris Air Show 2015 spread all activities of the event and provides all exhibitors with a global online window in parallel with Paris Air Show 2015 exhibition about the latest defence and security technologies and innovations. To increase the visibility of your Company, products and/or services you can book advertisement, advertorial, video add in the Online Show Daily Paris Air Show 2015. Air Recognition, media partner of Paris Air Show 2015, will provide an Online Show Daily news coverage of Paris Air Show 2015 with report, news, pictures and videos. Increase the exposure of your Company and its range of products globally with our Paris Air Show 2015 online show daily news. There is no charge to submit product and press releases for Paris Air Show 2015 to our team, but we can not guarantee that all press releases will be published. For the first time, Air Recognition will provide a Web Television to highlight the event at the worldwide level with video of inauguration, official visits, new military and security equipment releases, extracts from press conferences, top-leader interviews, live demonstrations and more. This new media will provide an Internet television networks and Web TV to promote Defense and Security Industry and products with high-definition, digital-quality video broadcasted on our new Website http://www.defensewebtv.com, our Defense Web TV Youtube channel and on Air Recognition's Paris Air Show videos and pictures dedicated page. The International Paris Air Show will be staging its 51st edition. This event, over a hundred years old, is the largest and longest-running aerospace trade show in the world. Since its launch, the Show has been at the very heart of developments in the global aerospace market, for which it has become the most important meeting place over the years. Open to professionals and the general public alike, it inspires a large number of vocations. 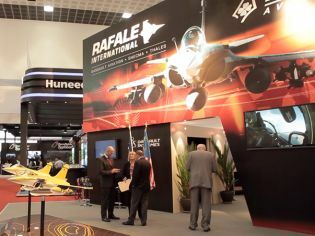 The 51th Paris Air Show will take place at Le Bourget exhibition centre from 15 to 21 June 2015, and will once again bring together all the industry's players across the globe to showcase the latest technological innovations. The first 4 days of the Show, exclusively for trade visitors, are followed by 3 days for the general public. The International Paris Air Show at Le Bourget is the ideal event at which to discover all the market's latest innovations and developments. This is where the major aviation and space technologies and trends emerge. All companies, constructors, components manufacturers and systems developers use this event to present their latest innovations to the world. In addition, every afternoon you can watch flying displays by some forty of the most modern aircraft in existence. During the last edition of Paris Air Show, some 150 aeroplanes, helicopters and drones were presented in flight and on the ground, including the A380 and A400M Airbuses, the Dassault Rafale and Neuron, the Boeing 787 Dreamliner, the Kamov 52 helicopter, and a ballet performed by the Tigres. The Patrouille de France, celebrating its 60th anniversary, gave a series of acrobatic displays throughout the Show, colouring the skies above Le Bourget with red, white and blue. And as the icing on the cake, we were able to admire the Airbus A350, which did a flyby in front of the French President only a few days after its maiden flight. A number of these are involved in the flying displays held each afternoon. These displays, which are always spectacular and often amazing, are one of the show's high points, giving exhibitors the opportunity to showcase their technological expertise and allowing visitors to discover the latest innovations. Paris Air Show 2015 Langwaki International Maritime and Aerospace Exhibition. First pictures and video Paris Air Show 2015, available before June 15, 2015.